I'm sorry. I'm running out of adjectives and I'm feeling like I'm starting to repeat myself. And without mentioning any names, I'm sorry that blogging is not all up to date every day so that when you wake each morning in Australia you can get your overnight TDF100 experience update. I mean, Leisl do you have any idea how tiring it is to get to breakfast at 7 or 7.30am after maybe only 7 hours of deep, uninterrupted sleep; pack your bag and carry it to the van (like without help); ride 100 odd kilometers up some fairly large lumps, whilst stopping every so often for photos, coffee and lunch; yelling weeeeeeeee or yaaahooooo (quite loudly) as you hit yet another descent loaded with smooth sweeping hairpins; then find a pub, drink panache, watch the tour; find your hotel, shower, hand wash your kit and try to organise your photos; then get to dinner at about 7.30pm and chew the fat about all the awesome stuff you did that day which doesn't finish until 10.30pm and you are engorged from sensational gastronomic delights; and THEN you try to blog. Dude...it's exhausting!! And no sooner have you done it, you have to do it all over again. And then again. Anyway - here we are. 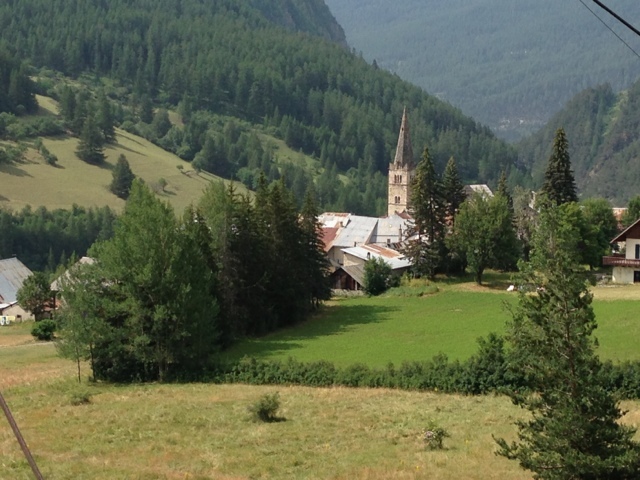 We started with a lovely 10k drop from the Pra-Loop ski resort. 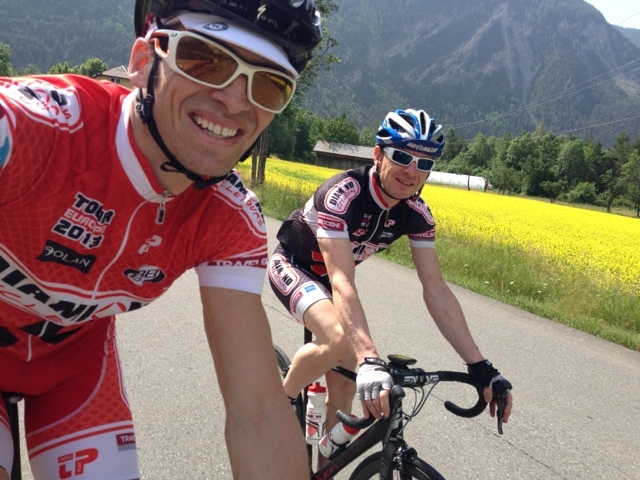 Into a fast 1-3% incline at a cruisy 32+kmh for about 15k and then our only hill for the day. 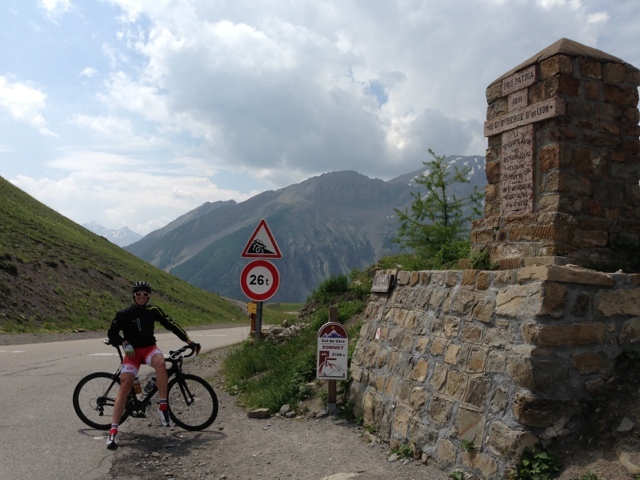 It was a classic French climb through forest and small villages, then above the tree line to the summit as the pitch went up. Paul and I tapped out a good tempo (for it was his last hill of the Tour) and then I hit the last 2k hard as we turned into a headwind on 10%. 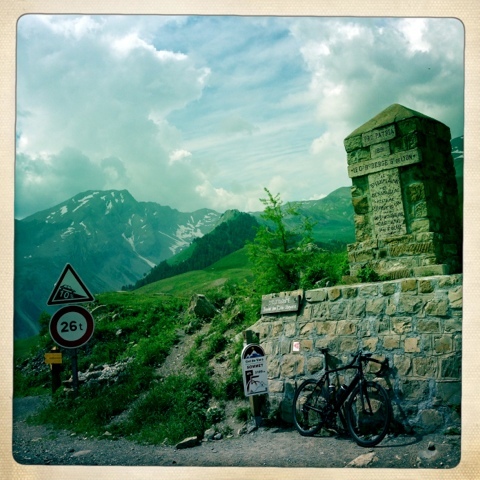 Great climb to Col de Vars. Here are just some of the spectacular views enroute. 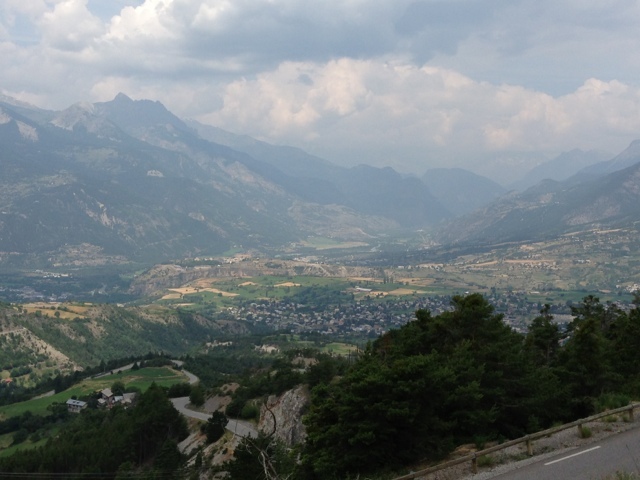 Now...the descent to get to Embrun was absolutely in the Top3 of the Tour. I'm not even going to bother trying to describe it. Simply beautiful. The road is bottom left...so sweet. We went pretty much straight to the start of the ITT. I mentioned yesterday it would be tough and those poor buggers faced a nasty long gradient straight off the ramp. 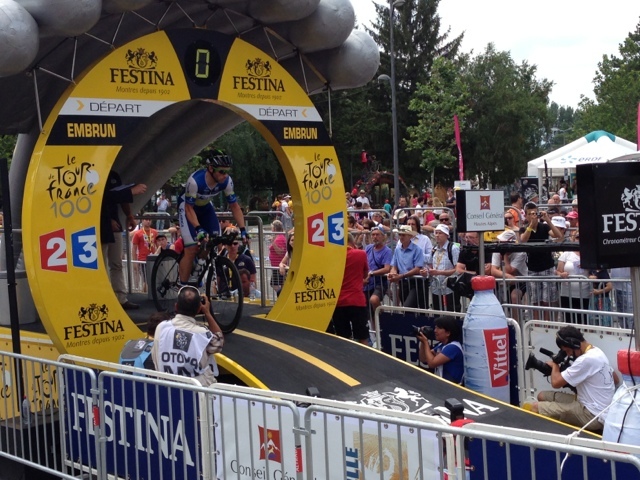 We got there just in time to miss Sagan but right on song for Alba, Gerro and Hansen. We gave Gerro a massive Aussie Aussie Aussie (there are a tonne of Aussies over here) as he was waiting in the starting house and he laughed. That was pretty cool. 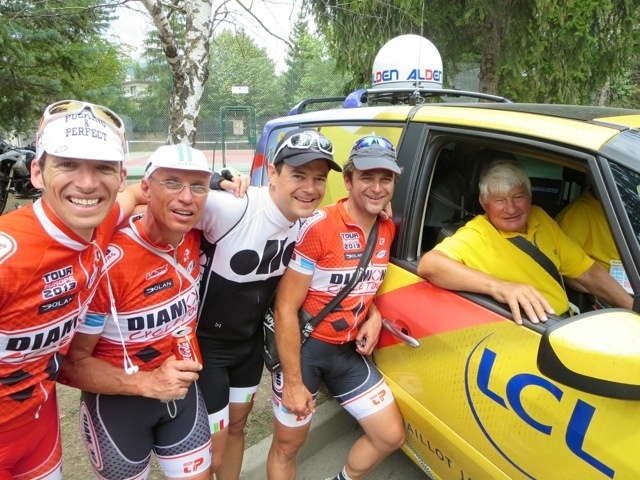 Just as we were leaving the starting area we bumped into Raymond Poulidor...massive TdF legend during the Merckx era (famous for never wearing yellow and 8 times on the podium without winning). He seemed happy about it though! 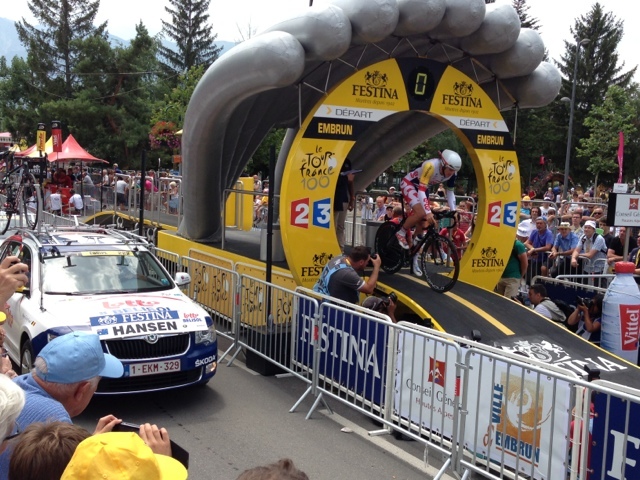 Then we ducked over to the base of the second climb of the ITT to watch the boys come past. It was cracker. We were close enough to see their eye balls, hear them breathing and appreciate the beautiful silence that is the whirring of magnificent machines being wound up in the big dog. 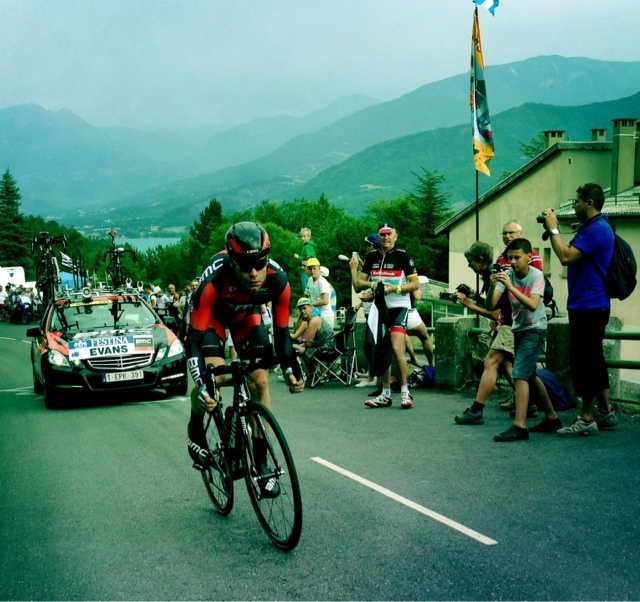 We even had time after the Froome-dog went past to cross the bridge back to Savines le Lac, get into the pub and watch on the big screen as Contador did his best, but Froome was better. A road side bird bath followed, into shorts n t-shirt, bikes on the roof and then a 3 hour transit to Nice. The drive was gorgeous, very windy and seemed to only go down. We basically went from 2,400m down to 0m. Even though we got into beachside Nice at about 11.30pm it was pumping. Three went out for icecream and a knee deep wade in the Med. I wasn't one of them - directly to bed...do not pass go. 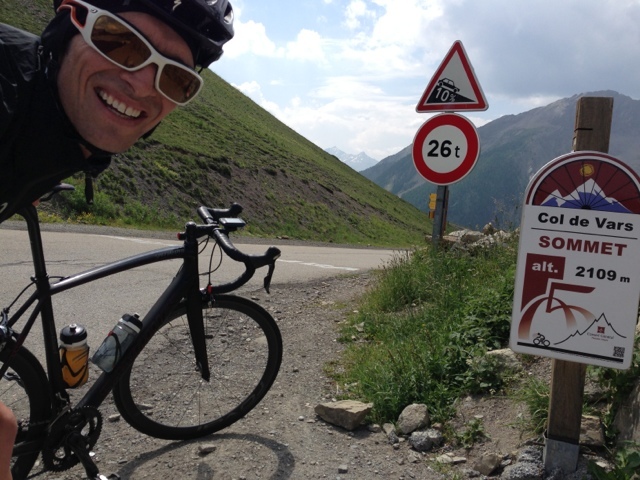 It was the last official day of my tour with Diamond Cycling Tours and it was a great, great day.